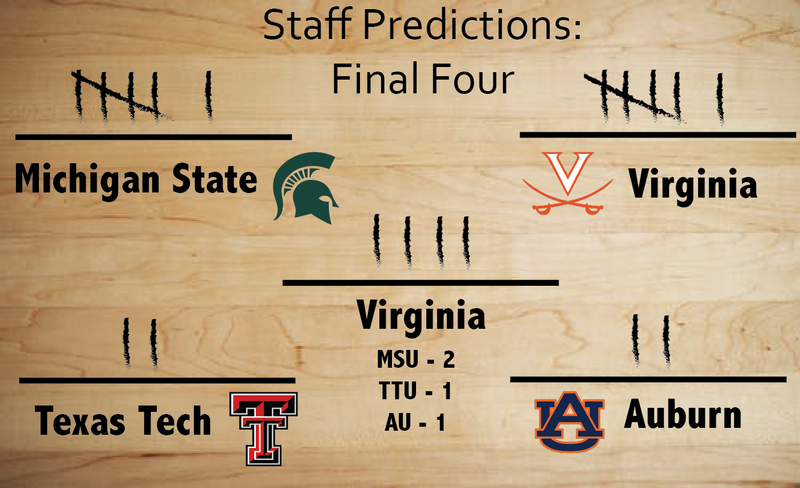 The sports staff makes their Final Four predictions. Graphic by Olivia Frzop. Virginia vs. Auburn: Bruce Pearl’s team is playing terrific basketball right now, which means the Tigers are finding ways to score other than the 3-point line. North Carolina and Kentucky allowed them to play at their preferred pace — fast and fearless. That’s not happening against Virginia. The Cavaliers have been the most consistent team in the country all season long and are much better offensively than previous Virginia teams. They control tempo and get a comfortable 10-point win. Michigan State vs. Texas Tech: This is the first Michigan State team in years that truly embodies what Tom Izzo wants his program to look like: rebounding, mental toughness and a strong interior presence. The Spartans have bodies to throw at Jarrett Culver, who needs to be special for Texas Tech to pull this off. I’ll take Izzo’s experience with the chaos of the Final Four and the best point guard in America. Virginia 62, Michigan State 57: Virginia gave up 42 points to Carsen Edwards and still won the game, getting 49 points from Kyle Guy and Ty Jerome in the process. The Cavaliers can score outside of their offensive system, which has not been the case in the past. Michigan State keeps things interesting, but Cassius Winston eventually runs out of gas. De’Andre Hunter causes the Spartans problems all game and is named the Final Fours Most Outstanding Player. The 30 for 30 is already being written as the final buzzer sounds. Virginia vs. Auburn: Unreal run by Auburn. Bruce Pearl deserves a ton of credit for knocking off a trio of bluebloods. After watching Virginia in person twice this season, I’ve come to the conclusion that the Cavaliers are the real deal. They have so many weapons and their pace makes the opponent uncomfortable. I love Kyle Guy and everything he brings. Jared Harper is so tough, but Virginia can trap Auburn. Its defense in a word? Suffocating. Michigan State vs. Texas Tech: This will be the first meeting between these teams in school history. Texas Tech rode its horses to an amazing run, but the “old town road” ends here. Michigan State is on another level right now. Tom Izzo is that man. You have an amazing player in Cassius Winston and several other guys like Matt McQuaid, Nick Ward and Kenny Goins who maximize what they need to accomplish. Jarrett Culver and Chris Beard will be tough to overcome, but I give the advantage to Sparty. Virginia 67, Michigan State 64: It will be a defensive struggle. Virginia plays Ziploc defense: air-tight. The Spartans will give it all they have, but Virginia has a plan in place. The Cavaliers know what works for them and they execute that plan to near-perfection almost every time. It’s been a great college basketball season, and Virginia is the best team that’s currently standing. Auburn vs Virginia: Auburn really turned some heads in the postseason. After a conference tournament championship in the SEC, most I feel didn’t expect much out of this team that finished 11-7 in the conference. Yet here we are, and the Tigers have topped three powerhouse programs in Kansas, North Carolina, and Kentucky. Do they have the magic to keep the streak alive? I don’t think they do. While Virginia has had its fair share of escapes on the road to the Final Four, the Cavaliers’ defense is unlike any that Auburn has faced all season. They continue their trip to redemption by stuffing the Tigers. Michigan State vs. Texas Tech: It’s not a surprise either of these teams are in the position they’re at. Neither of them are used to losing. With only six losses in 2019, winning was the name of the game for the No. 2-seeded Spartans and No. 3-seeded Red Raiders. Michigan State averaged about 41 rebounds per game in 2019, and its dominance continued in the NCAA Tournament. Couple that with the scoring ability of guard Cassius Winston, who averages almost 19 points per game, you have a team set to make that championship run. Sorry Texas Tech fans, but the line ends here. Michigan State 66, Virginia 61: This game will feature some of the best defense you will see all season. In a game where every possession counts, the pressure on players to take care of the basketball will be immense. With two head coaches who have a plan in place to set the pace and tone of the game, the battle for the ball will be a fun show to watch. But with a player like Kenny Goins snagging almost 10 rebounds a game, Michigan State will be have the ball more often than not. I’m looking to them to cut down the net in Minneapolis in 2019. Virginia vs. Auburn: In Auburn’s first three tournament wins, the Tigers shot roughly 43 percent from beyond the arc. They’ve also forced turnovers better than most any other team in the country this season, and their rebounding has improved. That being said, Virginia has been the most consistent team in the country this season and proven in this tournament that Tony Bennett’s slow-paced, methodical approach can work in March. The Tigers have struggled with defensive rebounding this season, and as the Cavaliers’ 18 second-chance points in their overtime win over Purdue show, they definitely have the ability to capitalize when given extra scoring opportunities. They’ll take advantage of Auburn’s mistakes en route to the national championship game. Michigan State vs. Texas Tech: Tom Izzo picked up just his second win against Duke in 13 games with a team that, while one of the best in the country, is not among the best Michigan State teams he’s had in recent years. It’s difficult to bet against the Spartans, but I believe Texas Tech has the ability to take them down. The Red Raiders have the best adjusted defensive efficiency in the country, won their first three games of the tournament by more than 15 points and held an amazing Gonzaga offense to under a point per possession in the Elite Eight in one of the Bulldogs’ worst offensive performances of the season. They’ll pull off the Final Four upset to head to the championship game. Virginia 59, Texas Tech 51: With the two best defensive teams in the country squaring off, this should be a low-scoring affair. But in the end, Virginia will force the Red Raiders into mistakes and take advantage. Kyle Guy will continue his amazing recent play, and the biggest factor will be the Cavaliers’ ability to control the tempo, preventing Texas Tech from ever really getting anything going offensively. The Cavaliers will cut down the nets in Minneapolis. Virginia vs. Auburn: Auburn found a way to beat Kentucky without shooting the three ball well. However, they’re going to have to do it in order to beat Virginia, which is just on a different level than the Wildcats. Virginia holds opponents to just 27.8 percent from beyond the arc. The Cavaliers aren’t going to let Auburn burn them from deep, and their pace of play will limit open looks for Auburn because they will have to get them in the halfcourt. Quite simply, Tony Bennett has the better team and will advance to his first national championship as a coach. Michigan State vs. Texas Tech: First and foremost, Tom Izzo has done the dance that is the Final Four, both on and off the court, before. Chris Beard and the rest of his Red Raiders will be going through it for the first time. Experience in the PR event that is the Final Four is important. On the floor, Michigan State has the bodies to take care of Jarrett Culver between Aaron Henry, Kenny Goins and even Xavier Tillman. I’ll take the team that plays solid defense, rebounds and has, arguably, the best point guard in the country. Sparty to the natty. Virginia 65, Michigan State 59: This is an awesome matchup, but I think it’s an instance where one team is simply better than the other. Virginia is more efficient on offense, shoots the ball better from deep, and doesn’t make many mistakes. Ty Jerome standing at 6-foot-5 will give Cassius Winston a lot of problems, and Virginia’s defense will trouble a Michigan State team that is prone to turning the ball over. And as the final seconds come off the clock, a documentary producer is plotting the plan to tell the story of a team that went from the first No. 1 seed to lose to the No. 16 to national champions. Michigan State vs. Texas Tech: Both of these teams have had strong seasons, but Michigan State has more depth than Texas Tech. Having one star compared to a couple of pretty good ones will really be the blow for Texas Tech. The Red Raiders have had a good run and proven that they deserve to be in this game, but Michigan State will run away with it. Auburn 67, Michigan State 66: For the sake of sticking with the underdog, I’m shakily betting on Auburn to take the title. Michigan State will most likely control the entire game, but Auburn will be able to see their weak spots and pull through with the win. I hope. I have a lot riding on this game. Texas Tech vs. Michigan State: In a game between the best offense and best defense in the country, Texas Tech limited Gonzaga to well below its season average. The Red Raiders have the ability to stifle any opponent behind Chris Beard, my pick for national coach of the year. However, experience is supreme when it comes to this stage of the tournament. I would not be surprised if Texas Tech becomes a household name in the future, but Tom Izzo and the Spartans have the best player in this game in Cassius Winston. They get the edge over Beard and the Red Raiders in their first trip. Auburn vs. Virginia: It will be a total battle of paces in Minneapolis in the game between the navy and oranges. Auburn wants to turn this to a track meet and chuck a bunch of long range shots, while Virginia wants to make this a snail race. In the game of the tournament so far, I was really impressed with the leadership of Guy and Jerome. With a underwhelming Elite Eight game, I expect De’Andre Hunter to take advantage of no Chuma Okeke for Auburn. The Cavaliers have the coaching advantage, too. Wahoos will make history in back-to-back seasons, for very different reasons. Michigan State 77, Virginia 74: I am a big believer that in single-elimination tournaments like this, momentum is key. The Michigan State team that we have been seeing in the past three games is on another level. They killed Minnesota, handled LSU and earned a hard-fought victory over the overwhelming favorite in the college basketball world in Duke. Virginia, on the other hand, squeaked by Oregon and Purdue. This would be Indianapolis’ dream matchup with Ben Davis’ Aaron Henry and Lawrence Central’s Kyle Guy, both of whom have played awesome as of late. Some might think this would be a boring game, but true basketball fans will enjoy it. Expect late-game heroics from Cassius Winston to be the difference. Texas Tech vs. Michigan State: I hate betting against Tom Izzo and his Spartans, but I have to in this instance. Sure, Michigan State might have better players one-on-one, but Texas Tech has a team mentality that has proven to work so far. Texas Tech is buzzing after beating a solid Gonzaga team, forcing their players to turn over the ball, especially Brandon Clarke. If they can do the same to Michigan State, they are bound to win. Virginia vs. Auburn: Auburn, while seeded as the underdog, are playing just the opposite of that. Virginia has holes that can easily be picked apart, and let’s not forget, they lost to a 16 seed last year. If Auburn can keep shooting lights out and spread the wealth, Virginia might as well warm up the buses at half time. Texas Tech 62, Auburn 50: The old saying of “you can’t win if you don’t score” will be Auburn’s truth in the final game. Texas Tech’s team defense will prove to be too much for the Tigers. The low scoring game will prove to be beneficial for the Raiders as they put their focus on the defensive end of the court. Congrats Texas Tech, have yourself a night.